By using our Website, you are agreeing to these Terms. Please read them carefully. Use of the Website and Acceptance of Terms. From time to time, we may update these Terms. For significant changes, we will notify you by posting a prominent notice on our Website indicating at the bottom of the Terms when it was most recently updated. As such, we encourage you to please check the Terms periodically for material changes. You agree to be bound by all the provisions of these Terms that are displayed on the Website on the date you use the Website. Your continued use of the Website, indicates your acceptance of all of the provisions of these Terms that are displayed on the Website on the date of such use. The Website and relevant content of the Website is protected by copyright, trademark and other laws of the United States. The AASNF, and its licensors, exclusively own all right, title and interest in and to the Website and content and any materials that may be available or downloaded such as patient forms, articles or other information, including all associated intellectual property rights. All trademarks, service marks, and logos referenced or appearing on the Website are the property of AASNF or their respective owners. The Websites’ content, including but not limited to, all photographs, graphics, videos and other imagery, may not be used, copied, downloaded, republished, reproduced, adapted, modified, distributed, licensed, sold, transferred, transmitted, streamed, broadcasted or otherwise exploited without our prior express written permission. Our names, trademarks, service marks, and logos that appear on the Website may not be used in any manner or for any purpose without our prior express written permission. 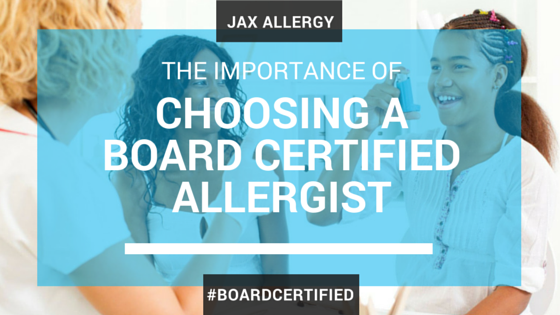 Our materials, including all blog posts, contained on the Website are copyrighted materials of The Allergy and Asthma Specialists of North Florida, P.A. Copyright © 2017. All rights reserved. We are committed to respecting the intellectual property rights of other parties, and we ask you, and the other users of our Website, to do the same. Pursuant to Title 17 of United States Code, Copyright Act, notifications of claimed copyright infringement for materials displayed, or available, on any of the Website should be sent in writing to us. You agree not to disobey any requirements, procedures, policies or regulations established by the owners or operators of any networks, hardware, or software connected to, or used in connection with the operation of the Website, or any requirement that we post on the Website. In collecting your Personally Identifiable Information (“PII”), our Website may also collect Personal Health Information (“PHI”). Just as we strive to protect your PII we are committed to protecting your PHI. If there is a breach of your PHI, we are required by law to notify you. Your PHI will remain confidential, and will only be disclosed to you or your personal representative, unless otherwise required by state or federal law. More information regarding our privacy practices for your PHI can be found in our Notice of Privacy Practices located on our patient forms page here. YOU AGREE TO ASSUME THE RISK OF ACCESSING AND USING OUR WEBSITE. OUR WEBSITE, INCLUDING ALL CONTENT, ARE PROVIDED ON AN “AS IS” BASIS, “WITH ALL FAULTS” AND “AS AVAILABLE” WITHOUT ANY WARRANTIES OF ANY KIND, WHETHER EXPRESS OR IMPLIED, INCLUDING BUT NOT LIMITED TO, WARRANTIES OF MERCHANTABILITY, FITNESS FOR A PARTICULAR PURPOSE OR NON-INFRINGEMENT OF THIRD PARTY INTELLECTUAL PROPERTY RIGHTS, TO THE FULLEST EXTENT PERMITTED BY LAW. THE INFORMATION VIA THE WEBSITE IS FOR GENERAL INFORMATION PURPOSES ONLY AND DOES NOT CONSTITUTE ADVICE. WE DO NOT REPRESENT OR WARRANT THAT THE CONTENT OR INFORMATION PROVIDED OR MADE AVAILABLE VIA OUR WEBSITE IS ACCURATE, COMPLETE OR CURRENT, OR THAT OUR WEBSITE WILL BE UNINTERRUPTED OR ERROR FREE, OR THAT ANY DEFECTS IN OUR WEBSITE WILL BE CORRECTED OR THAT OUR WEBSITE OR THE SERVER THAT MAKES OUR WEBSITE AVAILABLE ARE FREE OF VIRUSES OR ANY OTHER HARMFUL COMPONENTS. WE DO NOT MAKE ANY WARRANTEES OR REPRESENTATIONS REGARDING THE USE OF THE MATERIALS IN OUR WEBSITE IN TERMS OF THEIR CORRECTNESS, ACCURACY, ADEQUACY, USEFULNESS, TIMELINESS, RELIABILITY OR OTHERWISE, IN EACH CASE TO THE FULLEST EXTENT PERMITTED BY APPLICABLE LAW. INFORMATION PUBLISHED OR MADE AVAILABLE VIA OUR WEBSITE MAY REFER TO PRODUCTS, PROGRAMS OR SERVICES THAT ARE NOT AVAILABLE IN YOUR REGION. YOU UNDERSTAND AND ACKNOWLEDGE THAT YOUR SOLE AND EXCLUSIVE REMEDY WITH RESPECT TO ANY DEFECT IN OR DISSATISFACTION WITH OUR WEBSITE IS TO CEASE USE OF OUR WEBSITE. AT ANY TIME AND WITHOUT NOTICE, WE MAY, FOR ANY REASON WHATSOEVER AND WITHOUT INCURRING ANY LIABILITY OR OBLIGATION TO YOU OR ANY OTHER PARTY, TERMINATE OR SUSPEND THE DISPLAY, OPERATION AND/OR PROVISION OF (A) THE WEBSITE (OR ANY PART THEREOF, INCLUDING ANY CONTENT, INFORMATION, AND/OR MATERIALS); AND/OR (B) YOUR ACCESS TO THE WEBSITE. Our Website is designed to offer general information that educates users about the services that are available through our office. The Website is not intended to provide medical advice, nor should the information be used to attempt to determine the presence, absence or severity of any illness or medical condition which may be perceived or experienced by the user of this Website. The provision of information to users of this Website is not intended as an inducement to influence a person’s decision to seek service from a particular practitioner. You agree to indemnify, defend and hold harmless the Allergy and Asthma Specialists of North Florida, P.A. and all of our successors, assigns and licensees, together with any of their respective officers, directors and employees, against any damages, losses, liabilities, judgments, costs or expenses (including reasonable attorneys’ fees and costs) arising out of claims by a third party relating to your use or any unauthorized use of this Website, or any breach or violation of the Terms or any other terms and conditions contained on this Website. You shall use your best efforts to cooperate with AASNF in the defense of any such claim. We reserve the right, at our own expense, to assume the exclusive defense and control of any claim against you or use that is subject to indemnification by you. You agree that that in the event of any unauthorized use of our Website, any information, content, or materials, we shall be entitled to obtain an injunction proscribing such unauthorized use, without the necessity to post bond, and in addition to any other remedies available at law or in equity. Activities with Third Parties on or From the Website. 12.1 Linking to Third Party Websites from Our Website. From time to time, we provide links on the Website that will allow you to connect with websites of third-parties that are not under our control. We are providing these links only as a convenience to you. Further, there may be times while in the Website that you could be directed to websites that are beyond our control. This includes links from other organizations, sponsors or volunteers that may use our logo(s) as part of an agreement with us. These other websites may send their own cookies to users, collect data, solicit personal information, or contain information that you may find inappropriate or offensive. Links to other websites do not imply an endorsement of the materials, products, content, or ideas displayed on, or disseminated at or through those websites, nor does the existence of a link to another of our Websites imply that the organization or person publishing at that website endorses any of the materials or ideas at our Website. We reserve the right to disable links from third-party websites to any of our Websites at any time without prior notice. These Terms shall be governed by, and construed in accordance with, the laws of the State of Florida, without giving any effect to any principles of conflicts of law. You agree that any action at law or in equity, and/or any claim arising out of or relating to these Terms, our Website, and/or your access, and/or use, of any of our Website, shall be filed and litigated only in the state or federal courts located in Duval County, Florida. You hereby consent and submit to the exclusive personal jurisdiction of such courts for the purposes of litigating any such action or claim. These Terms constitute the entire and exclusive understanding and agreement between us and you regarding the Website, and it’s content, and these Terms supersede and replace any and all prior oral or written understandings or agreements between us and you regarding the Website and its content. If any provision of these Terms is found by a court of competent jurisdiction to be void, invalid, unenforceable or otherwise contrary to law or equity, the remaining provisions of these Terms that can be given effect without such void or unenforceable term or provision, shall be given full effect and binding on the parties. Our failure to enforce strict performance of any provision of these Terms, or to penalize any violation of these Terms, or to penalize you for any further violations of any provision of these Terms does no constitute a waiver of future violations.